Nadja M. Pierre, D.P.M. has been with Access Health Care Physicians, LLC since September 2013. She came to Access from New York, New York where she had been practicing podiatric medicine since 1997. Dr. Pierre completed her podiatric surgical fellowship at the prestigious Brooklyn Hospital Center on Dekalb Avenue in Brooklyn, New York. 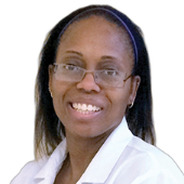 She completed her residency in primary podiatric medicine at Bayley Seton Hospital on Staten Island and completed her rotation in podiatric medicine also at Brooklyn Hospital Center. She received her Doctorate of Podiatric Medicine (D.P.M.) from the New York College of Podiatric Medicine in New York, New York. Dr. Pierre is a Diplomate of the American Board of Medical Specialties in Podiatry. She is fluent in English, French and Haitian Creole and is able to converse in Spanish. Dr. Pierre is a member of the American Podiatric Medical Association, the Fraternal American Podiatric Association, and the New York State Podiatric Medical Association. She has also served as vice president of the American Association of Women Podiatrists. She and her husband have two daughters. Her favorite pastime is reading.